Case 1 : A 24 year old pregnant woman presented with history of headache, continuous seizures, vision loss on left side. . .
A 24 year old pregnant woman presented with history of headache, continuous seizures, vision loss on left side and left side weakness. Her first symptom was only headache which started one week prior to the admission. When she had headache, she went to local hospital for treatment. She did not get any improvement. Within two days of initial symptoms, she started to have seizures with frequency of one- two episodes per day. So she was admitted in a private hospital and treatment started. But the seizures increased in frequency and she noted that she was having left hemi field vision loss and left side hemiparesis. So she was referred to a government tertiary centre. Even after treatment for four days, her weakness worsened, vision worsened, seizure increased to 10-12 times per day. And she became comatose. At this time bystanders forcefully discharged her and shifted to our hospital. She was admitted under Epileptologist in view of continuous seizures. She had undergone MRI & EEG . Our team started the treatment as per the investigations and diagnosis. She became better within two days and shifted to ward within four days. Within one week of treatment , her vision and weakness improved. After two weeks, she walked happily and discharged from our hospital. Her antenatal scans showed normal fetal growth and now she is happily enjoying motherhood. Case 2 : A 31 year old female patient, delivered 9 days prior to admission in our hospital. . .
A 31 year old female patient, delivered 9 days prior to admission in our hospital. She was very happy mother who was feeding and enjoying motherhood. On the 8th day of her delivery noted to have mild headache which suddenly increased to very severe throbbing headache. She got admitted in a local hospital . But her headache progressively increased .On the next day she had one episode of seizure and became comatose. So she was shifted to our hospital in view of seizure and headache. At the time of admission , she was drowsy and she was immediately shifted to ICU under the care of Epileptologist and a portable 24 hour EEG was connected . EEG monitor showed continuous silent seizures. Anti epileptic medicine in the form of injection was started for seizures. Within two hours of drug infusion, EEG showed reduction of seizure intensity and within 6 hours of admission, she regained consciousness and was in a state to talk legibly with full comprehension. Next day she was shifted to ward . MRI Brain showed multiple hemispheric bleed with SAH and possibility of atypical press was considered. She was continued on treatment. Medications were put in such a way that she can feed the baby also without any drug effect on baby. She was discharged after one week in a fully healthy state. 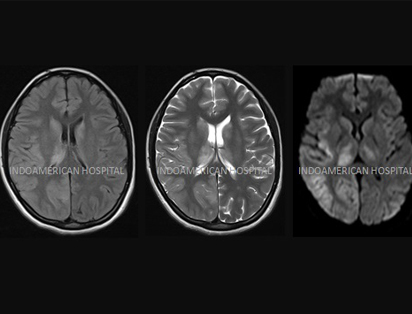 Case 3 : A 11 year old female child admitted here with complaints of multiple episodes of seizures and right infantile hemiparesis. . .
A 11 year old female child admitted here with complaints of multiple episodes of seizures and right infantile hemiparesis . First episode of seizures noticed at the age of Six and Second one at the age of Seven. At the age of 11, the episodes of seizure increased frequently per day. So this female child was admitted here under Epileptologist with status epilepticus . As per the investigations , she was diagnosed to have left hemispheric seizure and right infantile hemiparesis. She was treated conservatively and her condition improved within 2 days of treatment. On the 3rd day she was discharged without any deficits. Case 4 : A four year old child admitted here with head Injury after a Road Traffic Accident. . .
Case 5 : Early detection of adult onset Susac’s syndromein a South Indian female 26 year old young female presented to our OPD . . . Early detection of adult onset Susac’s syndromein a South Indian female 26 year old young female presented to our OPD with complaints of headache for 2 years duration. She was on treatment from several centers for the same problem but with no relief. She also had visual disturbances for 2 months and decreased left-sided hearing since 1 month. 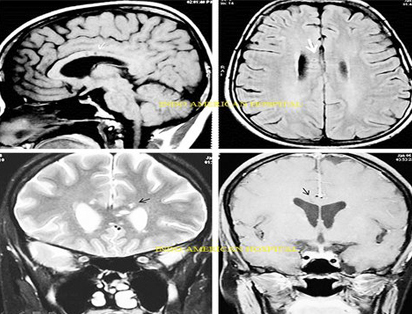 Magnetic resonance imaging (MRI) brain showed lesions in body of corpus callosum [Figure 1a]. 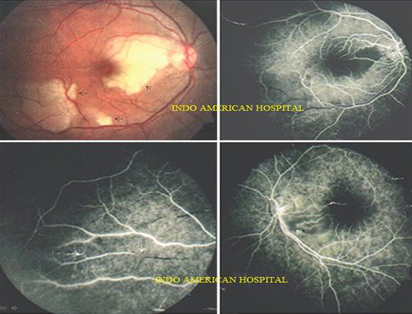 Color fundus photography of her right eye [Figure 2a] shows multiple greyish white puffy patches, secondary to retinal artery branch occlusions. Late phase of fluorescein angiogram of right eye revealed blocked choroidal fluorescence in all the three corresponding areas [Figure 2b]. Right eye inferior temporal quadrant late phase angiography, shows [Figure 2c] retinal artery branch occlusion and the left eye posterior pole late phase [Figure 2d] showed blocked choroidal fluorescence due to retinal thickening. Pure tone audiogram (PTA) showed mild sensory neural deafness. Visually evoked potential (VEP) study result is suggestive of demyelinating type of visual pathway defect on the left side. The case was discussed among experts in our hospital. The combination of patient’s clinical picture of encephalopathy, branch retinal artery occlusions (BRAOs), and hearing loss in combination with the characteristic imaging features, the patient was diagnosed with Susac’s syndrome, a rare disease reported. With institution of appropriate treatment at right time she was relieved from her headache and showed improvement in her vision after 1 month.